Guests of the Ritz-Carlton have a choice six facials in this spa, if you include the one that they offer for men. I chose the Signature facial for the custom approach to this treatment. In my heart, there is only one option when it comes to facials, the eighty minute facial. This spa offers fifty minute facials as well, but those are just a tease in my book. By the time your esthetician discusses any skin issues, gets you settled on the heated table, customizes the treatment, and gets the steam going, that would make a 50 minute facial only 45 minutes of goodness. I am not down with that! My esthetician today is Kathleen. 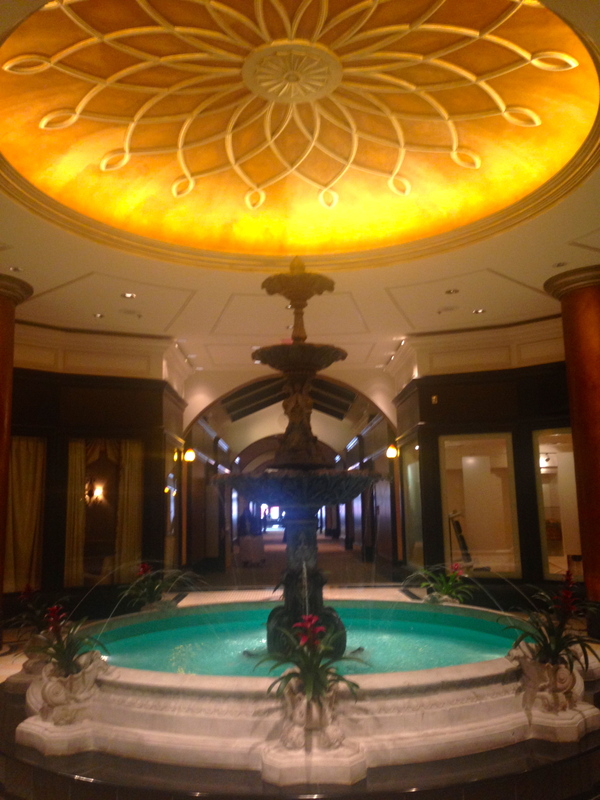 A beautiful reception area includes amazing fountain. 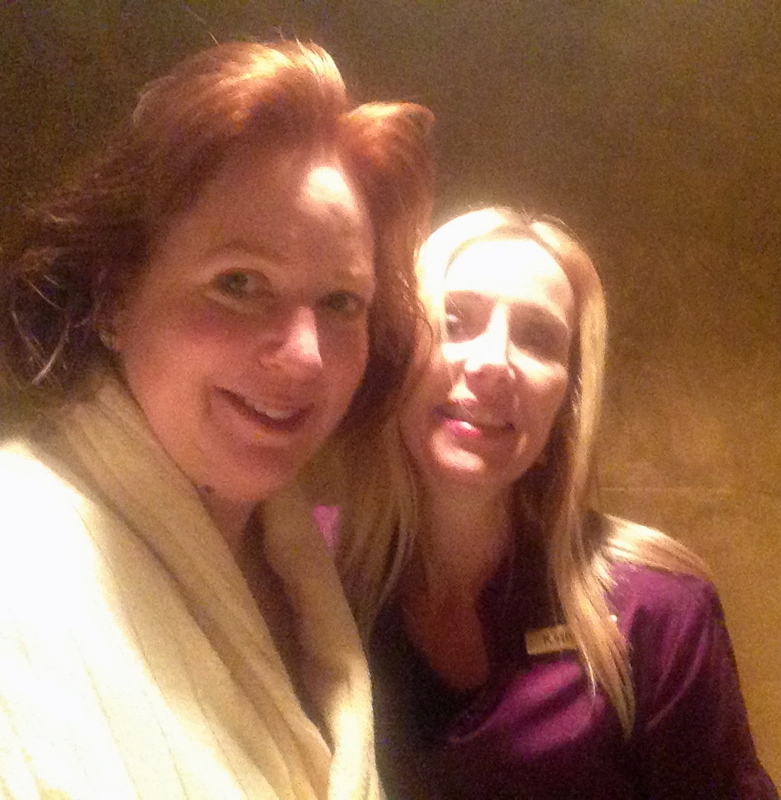 Kathleen was able to understand what I needed from this treatment. She knows I’m on vacation, because she asked. She also knew my skin would be dry from the long flight and a bit dehydrated from some delicious beverages that I have enjoyed while on Bourbon Street. My intention was to get a moisturizing facial and address any signs of aging appearing on my face. 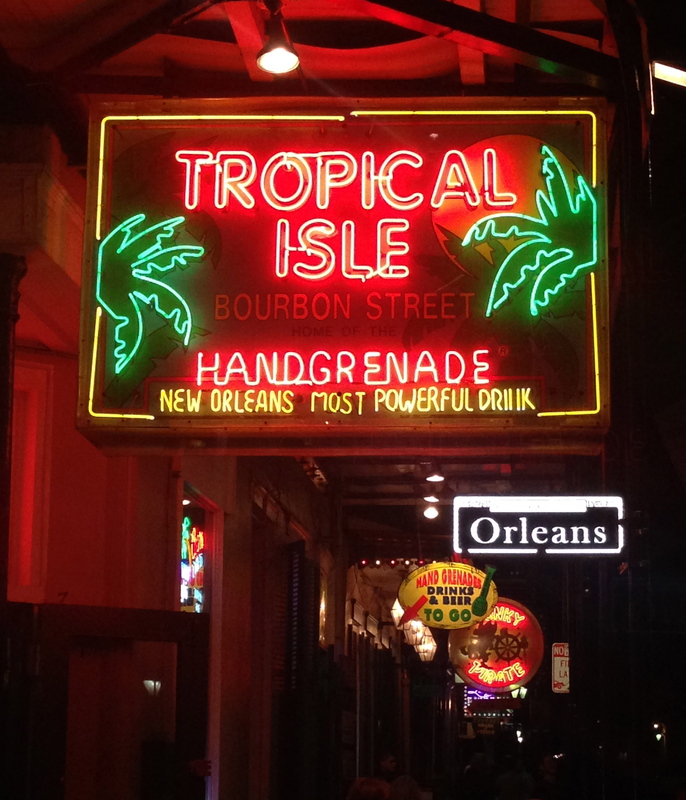 Just around the corner from the Ritz is Bourbon Street, one of the most fun streets in the United States. Sometimes I am in a quiet, meditative mood while in the spa, but today, I was not. I booked this appointment at 11am. I had already been in the spa for a while and was able to enjoy some Champagne (straight, no orange juice for me)! Intuitive staff already knew my affinity for Champagne from the day before. I was able to meet some other ladies in the plush locker room, also into town for the same convention. I was in a pretty chatty mood when I met up with my therapist. Beside being a knowledgeable esthetician, Kathleen was able to adjust to my mind-set and we had fun discussing other treatments and restaurants that I might like. She was professional, fun, and helped me my narrow down some of my many restaurant choices while in town. There are so many great restaurants to choose from! 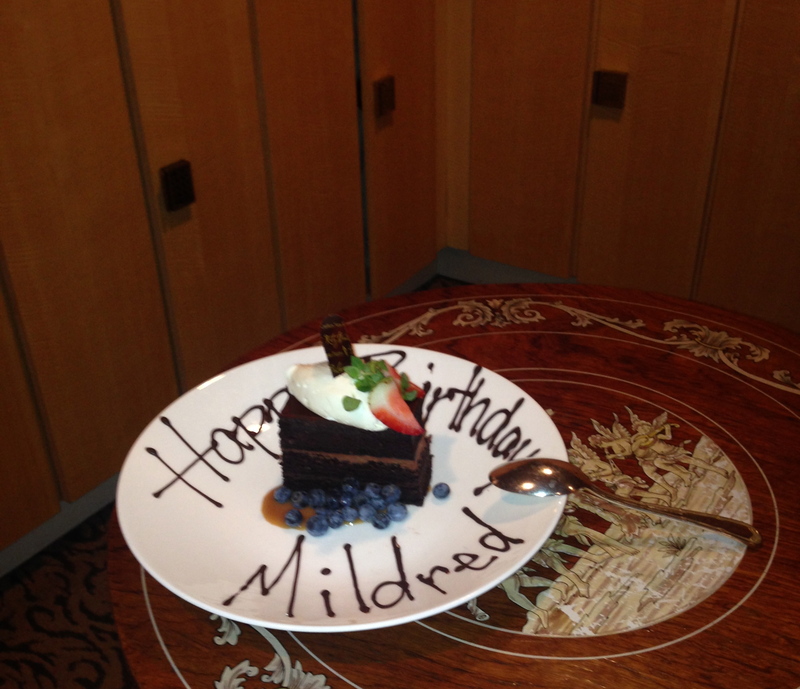 I did not meet Mildred, or I would have asked her for a bite! An amazing spa for special occasions. About my treatment, I really like it when a spa is not tied to one product line. Multiple product lines means that I can get a truly custom facial. I can get products that I can’t find at home, find an old favorite, or just sampling something new. This spa has a serious arsenal of products so the options were amazing. After discussing my options, we quickly decide to continue on with the Dr. Gross product line. I was introduced to this line in January while at the Ritz-Carlton Grande Lakes property in Orlando, and I really liked it. I also decided to add-on the alpha beta peel. 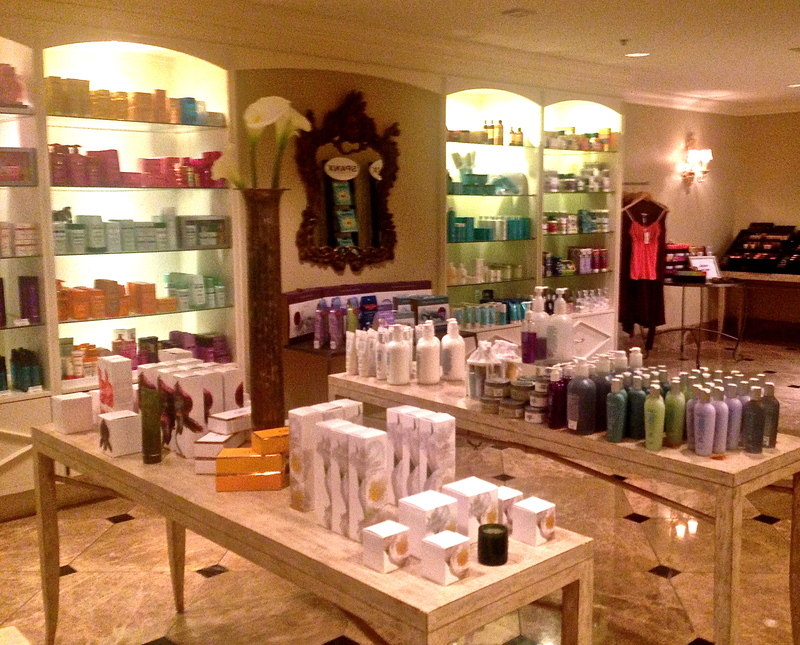 Large retail area includes all of the beauty arsenal and other carefully chosen spa products. Here is the thing about add-ons. Usually, they do not add time to your service, and they will almost always cost additional money. But, it is a great way to try new treatments and products. Some of my favorite facials have had a scalp treatment add-on. Other popular add-ons are lip and eye treatments or hands and feet paraffin treatments. Kathleen was not pushy, but just simply offered the Alpha Beta Peel as an answer to my issue with aging. This peel uses natural alpha-hydroxy acid (AHA) and beta hydroxy acid (BHA) to lightly remove dead skin. The goal of this peel is to reduce appearance of fine lines, address acne, rosacea, and oily skin. Excellent! I have all that, sans the rosacea. This natural product was applied nearing the end of the treatment and followed up with the application of many moisturizers. There is no downtime with this particular peel. It is not as harsh as a chemical peel or other higher potency natural peels. Due to it’s lower strength, there will be no redness, flaking, or peeling. Expect more downtime with products found in physicians offices, versus a spa environment. When I bond with a therapist I take a photo to capture my crazy spa hair! Kathleen is amazing. I loved this facial. Great news, I did not need too many extractions, and if I did, I already had my champagne, so no worries there! Kathleen did a great job explaining the many steps in this facial and the products used. She pampered me with lots of massaging strokes, all while answering my many questions about this fun city. When she finished the service, I was definitely more relaxed, my skin felt more moisturized, and I had a bit of a glow. She reminded me to leave the products on as long as I could, and to take care if I was in the sun. She also gave me a note with the names of the products she used for my reference. I find this helpful, as really good treatment tends to give me “spa brain.” She walked me back over the relaxation room where I met up with two friendly, local ladies enjoying a spa day. They were enjoying very fancy, mini cheese burger sliders in their robes in between thier services. No judgement at this spa! It is an oasis in the heart of the French Quarter. Always discuss your current regimen with your esthetician, don’t forget to mention any peels, laser services, or other topical products that you use on a daily, weekly, or monthly basis. If going to the beach or pool after a facial, be sure to wear a hat. Keep one in your spa bag along with sunscreen. Have you had any special add-ons to a facial you recieved? What was the add-on and was it worth it? Enjoyed reading your informative and entertaining spa review. Any recommendations for a good facial closer to home? Thanks for the recommendations for facials. About The Homestead, only if we throw in a round of golf as well! Of course, darling! I can’t wait for warmer weather!!! give something back and aid othеrs such as you aideԀ me. I wanted to visit your site, but the link did not work 🙁 Thank you for visiting! Hmm it looks like your website ate my first comment (it was super long) so I guess I’ll just sum it up what I had written and say, I’m thoroughly enjoying your blog. An added important part is that if you are a senior citizen, travel insurance intended for pensioners is something you must really think about. The elderly you are, the more at risk you might be for permitting something bad happen to you while in another country. If you are not necessarily covered by several comprehensive insurance, you could have several serious challenges. Thanks for revealing your good tips on this web site.